For God’s sake, what are we doing in Libya? In the broadest sense, we are helping a group of armed militia (i.e. unlawful combatants) in the overthrow of a sovereign government. More narrowly, we are destroying the defenses of the legitimate leader of Libya, instructing him that he is not allowed to defend himself, cutting off all of his escape routes, blocking all of his communications, and assisting a mob of criminals in his demise. 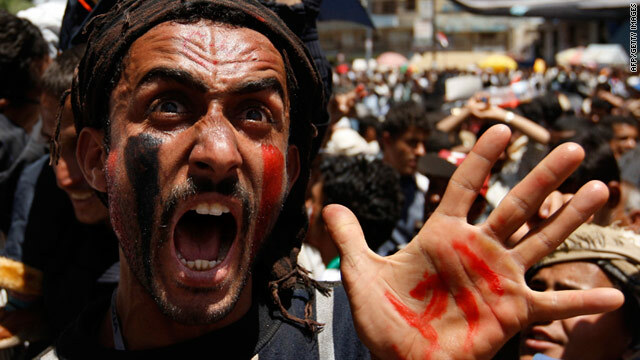 When these violent protesters catch Gaddafi, they will surely decapitate him, and many Americans will cheer, but not me. News networks like CNN are now praising the martyrdom of a rebel suicide bomber who drove a truck loaded with explosives into a Libyan army barracks and detonated it. But I ask you, “What’s heroic about that?” When a similar group of rebels drove two truck bombs into buildings housing United States and French military forces (October 23, 1983 in Beirut, Lebanon), were you cheering then? If you weren’t cheering then, why are you so giddy now? For the last three decades, terrorist acts were deemed to be the epitome of evil, but now terrorism seems to be in vogue, at least according to today’s hypocrites. Obama has in essence sided with terrorists against an ally in the war on terror. When these terrorists take over and murder their former leader, with Obama’s help, what will become of the two million people who support Gaddafi until the end? Will they suddenly have a change of heart and conform to the will of Obama and his rebels? And if they don’t, will they be thrown into gulags, beheaded, or lined up before firing squads? And if this happens, will America come to their defense, thus starting the vicious cycle over again? Will America ever get it? What we should have done. We should have exhausted every means of diplomacy. Going to war should have been the last resort. We should not have responded to Gaddafi’s rhetoric. Just because someone says they’re going to do something, doesn’t mean they will. Surely if anyone understands this, it should be the mis-leader of the not so free world, Barack Gbagbo, oops, I mean Obama. After all, by now he’s made hundreds of statements which have turned out to be nothing more than blatant lies. And speaking of Laurent Gbagbo, the incumbent president of the Ivory Coast was voted out of office in November of 2010, yet remains in power unto this day. Alassane Ouattara is widely recognized as the winner of the election, yet since his victory, the UN says that 462 people have been violently murdered, and about 500,000 forced from their homes in a post-election dispute. In the Ivory Coast you have a democracy which has been violently usurped by a despot whose original mandate expired on October 30, 2005. It’s ironic that when Gbagbo won his election in October of 2000, he faced the same situation, an incumbent who had to be forcibly removed from power. It seems there will be no end to this ongoing scenario in most of Africa, yet in Libya there was relative stability, until Obama. 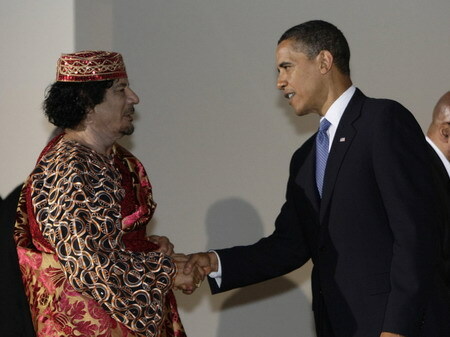 If Obama, who has foolishly committed us into the disorder of his homeland, succeeds in ousting Gaddafi, he had better make sure that he kills all 2 million of Gaddafi’s supporters as well. Are you prepared to do that? Otherwise Libya will face the same future as the Ivory Coast, coup after coup, revolution after revolution, and murder after murder. The only thing Obama has accomplished by involving the USA in his God-forsaken homeland is to expose why he was unqualified to be president of the United States in the first place. Don’t talk to me about impeachment unless you fully intend to follow through. The sooner we get rid of Obama, the sooner the World will return to relative stability. The problem is Obama, not Gaddafi. Free Gaddafi! And as for Obama, “go back to Kenya”. Seriously though I have been wondering that myself. There is no rhyme or reason for us to be in Libya. Perhaps the President thought that this was a good opportunity for the first time since the war on terror started for us to work cooperatively with Al Qaeda?